Construction Gantt charts are popular in modern project management in both business and non-profit sectors. 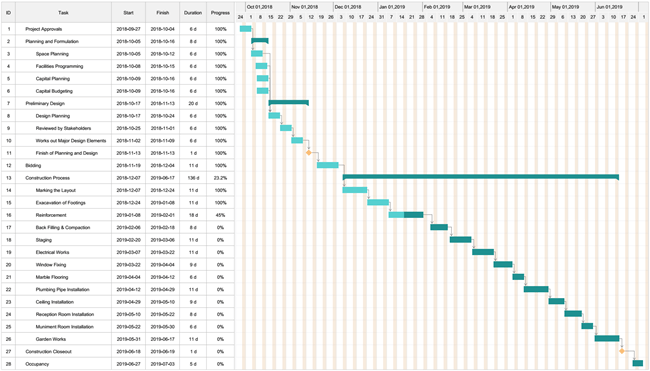 Read this detailed article for more key points and skills to create a professional and visually applearing construction Gantt chart. 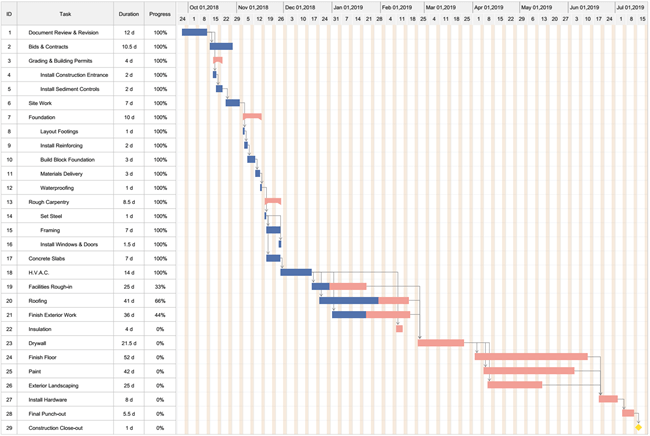 Why Use Construction Gantt Charts? How to Estimate Construction Project Cost? How to Create a Construction Gantt Chart? Construction Gantt charts show a clear visual colored-bar based presentation of a number of breakdown individual tasks within a time period. The horizontal axis shows the time sequence while the vertical axis lists all the tasks need to be completed. Project managers can use construction Gantt charts to adjust tasks relationships, manage task period, update progress, insert milestones, assign resources and generate cost reports etc. 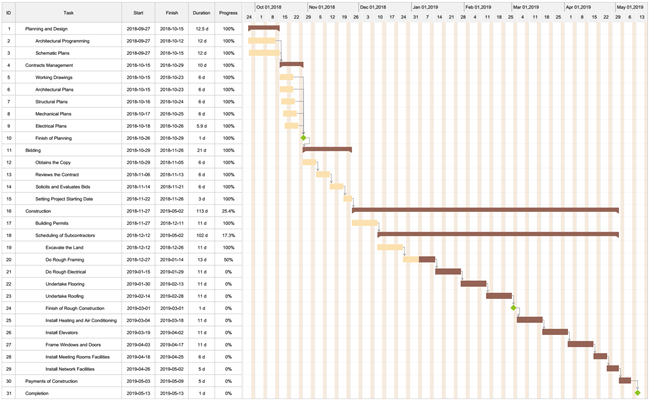 You can click on the general construction Gantt chart example below for more details. Construction management is a type of professional service that integrates with advanced project management theories and models to plan, design, and construct a building. Normally, construction management includes the control of project period, budget, safety record, construction inspection, risk management, and quality assurance etc. So far, construction projects have been used in building many places such as airports, schools, hospitals, governmental halls and so on. 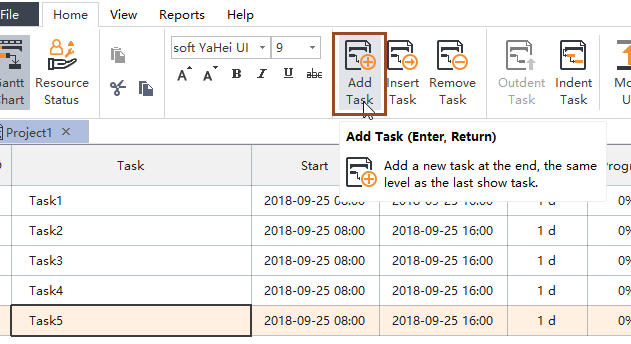 Time and task management are always vital in construction management projects, and construction Gantt charts are great for managing various kinds of task relationships. For example, the task sequence, the priority level of each task, the dependency of tasks, the completion time of tasks, the duration of every single task and more. In this case, a construction Gantt chart offers a great network based on a logical progression toward a final success of a project. This mainly refers to agricultural facilities, economical buildings, public water supply channels, governmental buildings, educational institutions, hospitals, military halls, museums, transportation infrastructure facilities, manufacturing plants, seaports and more. This type is what we see and use every day, for example, our home buildings, houses, apartments and so on. This is for the uses of commerce, business, trade and services. Examples include shopping malls, private banks, international hotels, office buildings and more. This section normally involves the project approvals; planning and formulation of existing facilities, capitals, schedules, scope and budgets etc; the design process of major components of the project; and the bidding process of the construction project. The process is the most important part of an overall project. A project manager or team leader manages the implementation of the project according to the Contract Documents. Some other key issues and activities include the budget management, the regular meetings between parties, the follow-up notifications of all the key project milestones, the shutdowns of certain utilities, the clearance of chemical materials and so on. In theory, this is usually the final step of a construction project when the constructor has done all remaining items and have completed all final invoice of the project. However, in reality, the customer may often review the construction Gantt chart with the team leader to check the whole project for unfinished items. How Could I Effectively Estimate My Construction Project Cost? 2. Calculate based on the unit price for a certain period of time; for example, the weekly or monthly price times the given time schedule (without overlapped tasks). This method also works for multiple tasks or teams. However, don't calculate every piece of equipment or every hour of working labor to avoid inefficiency. 3. Consider potential influencing factors such as complex site conditions, delays in specific tasks and other difficulties that we may face during a construction project. In this case, try to put an estimated increase in percentages on your original cost or budget. 4. Regularly check and compare your data in the construction Gantt chart weekly, monthly or quarterly, and make adjustments if necessary. 7. Print or export your construction Gantt chart to PDF or Excel format for your team members, external partners and stakeholders. Any Good Construction Gantt Chart Software? Generating simple, manageable, shareable and flexible Gantt charts for many industries and fields is exactly what Edraw Project can do for you. The easy and intuitive user interface makes it quick for the beginner to get started on creating visually appealing Gantt charts in just minutes. The software also has advanced project management capabilities such as cost reporting and monitoring. Get started with Edraw Project right now by clicking on the Free Download button at the end of this page.